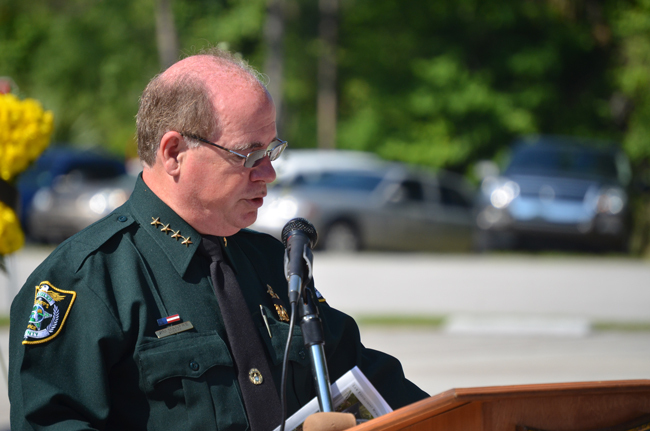 The latest shake-up at the Flagler County Sheriff’s Office is almost as consequential–and possibly more so–than the firings and reassignments Sheriff Jim Manfre implemented within hours of taking office in January. Monday afternoon, Manfre announced the surprise hiring of Jeff Hoffman, the Bunnell Police Chief, as Senior Commander of the agency’s Neighborhood Services Division, replacing Paul Bovino, who, according to a sheriff’s release, “has requested to return to the Neighborhood Services Division as a Platoon Commander.” All lieutenants in the agency have been either fired or given new ranks, as the position of lieutenant no longer exists. In all, Manfre said, eight middle management positions were replaced with six line deputies, with two of the middle management positions eliminated altogether. But along the way, the sheriff’s office has lost a great deal of institutional memory–and experience. The sheriff fired Lieutenants Greg Weston, Lynne Catoggio and Steven Birdsong, whose combined experience with the sheriff’s office exceeds half a century. Their last day was today. Nevertheless, Bovino’s ideas are influencing the way the department is reorganizing, Manfre said. Catoggio and Weston had been supporters of former Sheriff Don Fleming, and as with the firing of Maj. Steve Clair in January–another officer with more than 20 years’ service at the agency–their firing may not entirely evade the appearance of some some settling of accounts. Manfre dismissed the notion that there was anything political about the moves, claiming he never knew who supported whom in elections. The latest reorganization, he said, was the result in large part of interviews an oral board held with personnel before the reassignments and firings were carried out. The board included the human resources director, Under-sheriff Rick Staly and, ironically, Hoffman, brought in as an outsider for more objective judgments, Manfre said, before Manfre decided to hire Hoffman, and before Bovino said he wanted to move back to the trenches. Hoffman’s move to the sheriff’s office after just 14 months as Bunnell’s police chief is the latest wrench in that city’s increasingly chaotic machinery: Since the Bunnell City Commission essentially fired Manager Armando Martinez (by refusing to renew his contract, which expires in October), the city has seen its finance director resign in anger, followed by its long-time City Attorney, Sid Nowell (who happens to be the sheriff’s attorney), then Nowell’s replacement, Lonnie Groot, just last week, and now Hoffman. The city has just hired a new finance director. But that still leaves the city with three of its most critical leadership positions to fill. Manfre was asked directly if the hiring of Hoffman was the first step in the sheriff taking over policing in Bunnell. The Bunnell City Commission’s current majority may be more inclined than previous majorities to explore contracting with the sheriff for policing services. Manfre said that that would be an entirely politival decision on the Bunnell City Commission’s part, and that absent three votes from that commission inviting him to make a proposal, he would not do so. Lt. Robert Weber, of the Community Outreach and Media Relations Section will remain in their present assignments with additional duties as Section or Platoon Commanders. There will be no change in their annual salaries of $77,000. Hoffman retired from the Daytona Beach Police Department as a captain after 20 years when he took the police chief’s position in Bunnell–a position the sheriff’s news release did not allude to, though it edscribed at lenth Huffman’s service before that. He’ll begin at the sheriff’s office on Oct. 7 with a salary of $83,000. “Sheriff Manfre, in seeking to fulfill his pledge to county residents to reduce the number of upper management positions in the agency, eliminated all law enforcement lieutenant positions and directed Undersheriff Rick Staly to fill four Commander positions,” the sheriff’s release stated. Well now isn’t that just lovely. So now we basically have no veteran officers and a bunch of kids to protect and serve a whole county. The whole county should be concerned at this point in time. Worst Sherrif in history goes to Sherrif Jim Manfre! Congrats! Would you like a plaque? I told everyone on this page they had very short memories, we got rid of this thieving dirt bag for a reason, he obviously has no respect for the people who`ve served this community for yrs , one minute he`s demoting them , then singing their praise , then sticking a knife in their backs, he`s acting like a senile old nag that needs to be put out to pasture………….AGAIN!!!!! On the Muppet show tonight ! Just how much experience has he flushed since taking office? This is beyond ridiculous! At some point he will need to explain his actions. Unfortunately for Joe tax payer it will be his burden to pay all the legal bills that will surely be coming. If I was in the SO at this point I would be looking over my shoulder, who knows who will be next in all this craziness. By the time the lawsuits end…Manfre won’t save you a plug nickle, and will cost you more. All he is accomplishing is putting political inkspots on good officers resume’s and making them go elsewhere where they are appreciated. As for the rest of the department, I hear it is a bad year for that “Green Flu”. These $70,000 and $80,000 salaries are uncalled for. If Manfre as sincere he’d e really cut the fat! There more work to do Manfre. Get rid of some of those kid Deputies too…what a joke! You can’t get rid of the “kid Deputies [sic],” and layoff the experienced officers to save money. You pay for experience with financial compensation. The more-experienced, accomplished, competent officers make larger salaries. But I guess you would probably say the same thing about school teachers. You can’t get experience without paying for it. Firing the experienced officers because they make too much money. and the “kids,” because they are inexperienced leaves you with a bunch of empty patrol cars to police this county. Word around the stations is he is getting rid of anyone that is close to retirement. Why does everyone keep referring to experience being cut??? Did experience save Francoise Pecqueur??? How about the deceased family in Ocean Hammock??? How about the gang members that HAD to be charged retroactively under “RICO” because they were allowed to settle in without interference, which resulted in the death of a young man. What are most of you crying about anyway, I thought your home arsenals made you yourselves the law? Speaking of home arsenals…Will there be a militarized tactical police home raids this year ? Should I reinforce my doors and windows ? In regard to Ms. Pecqueur, it was a tragic event however, the policy that police did not respond to what was at the time deemed a medical call was a policy put in place by Manfre during his first term. The BPD are the ones that should be looking over their shoulder. The City Commission should stop messing around and get a proposal from the SO. It makes perfect sense now. I hope Hoffman realizes that he just signed up for a voyage on the HMS Titantic. He would have been better off staying in Bunnell, even with all of their problems. @ Louie, so you believe the purchase of the hospital and all these other moves are to take over Bunnell? If so it does make sense. Don’t blame me! I voted for John Pollinger! This wouldn’t have happened if Pollinger was sheriff. I guess he wasn’t pure enough to be a Republican. It’s always unfortunate when people lose their jobs, but hiring Hoffman is the best move Sheriff Manfre could possibly make. Hoffman and Bovino are the best cops in Flagler County and now the Sheriff has both of them. FCSO is for the better now. It’s 1/2 century collectively. Regardless, experience does not make someone a good employee or good deputy. I know the command staff he has put together will direct the road deputies and pull FCSO back together. They have been so torn apart these last 8 years and accumulated a lot of dead wood…Manfe is making every officer accountable and responsible and trying to clean the mess that Fleming left behind. Let Bunnell get a manager in there that isn’t two shades shy of being indicted and then they can focus on trimming the budget being seeking competent police services and eliminating thier black-eye Police Department. This comment is going to get me beaten up by others here, but shouldn’t the new Sheriff have the right to reorganize and select those loyal to him? Isn’t his show to run? Under Fleming, we had deputies making high salaries, crimes not being solved or resolved, favoritism, and the Sheriff assuming he could accept freebies. Not sure how you can call this guy the worse Sheriff we have ever had. As a former police officer and candidate for Flagler County Sheriff I feel compelled to comment on the most recent round of firings and demotions by Sheriff Manfre. Back in March of this year I spoke out against the dismissal of the Chief Deputy and several others. I expressed the hope that the Sheriff would get back on track. It is now clear this is not going to happen. With the hiring of Chief Hoffman who is to replace Commander Bovino as head of patrol this will mean that in the last seven months three people have held the position. In addition, the important rank of secondary line supervisor (lieutenant) has been abolished and replaced by a more nebulous title of commander which incorporates both second-line supervision duties and managerial responsibilities. The exodus of key personnel in the Sheriff’s Office creates instability and uncertainty that is bound to have a negative affect on all line personnel. Let us hope that with the hiring of Chief Hoffman, continuity will return. Let’s hope he is there long enough to make a difference. With all due respect Mr Stevens, my opinion is you share blame in what is happening now at the Sheriffs office. As a republican candidate you claimed Pollinger wasn’t republican enough. Then when you both lost the primary (you having a significant amount of votes) you backed the democrat candidate instead of supporting your own party line. Not the first time anyone has jumped party lines for the promise of a job. If my memory is correct Karback and Howell did it as we’ll only their opposite party candidate lost last time. Unfortunately, bringing down the mighty Fleming was a bigger goal than doing what was right. It made for some strange bedfellows. Some of that detective experience may have paid off had you exercised some of it. This was your second go round and its too bad you didn’t know better. Ray Stevens you are an opportunist. You willingly supported this Sheriff in November. Not only did you make a contribution to his campaign, you actively campaigned for him. Then had the audacity to be on his transition team. Now you are Johnny come lately with your arm chair quarterbacking. You are very much at fault for this as is anyone who was a supporter of Jim Manfre. Nice attempt in trying to save your own prospects at an attempt to run again in 4 years. You constantly bash other candidates when you were to incompetent to have been elected or appointed to office. So answer this for everyone. Are you going to run again for the 3rd time for sheriff or will you just be the noise that goes bump in the night? Demote then promote then demote again? That is just a single example. It is amazing that it is almost always an officer who was a staunch supporter of the past Sheriff. Claire, Plummer his entire civilian staff to include the janitor, Sgt Ragazo, Catain Catogio, Lt. Birdsong, Lt. Ditolla, Lt. Weston were active supporters. There has to be a law against such blatant political retaliation. Even two of the 83 K a year employees he brought in with him have bailed abandoning the agency in the past few months citing difficulty working under a TYRANT. This weasel has to go and we can not afford three more years either. Sounds like a vendetta to me. A few fun facts for the HR department person. 1. You demote them, then promote them again so you can fire them under the pretense of “job elimination”. I guess in his off time, Mr. Manfre and his HR “yes” man read a book on Corporate America and given Mr. Manfre’s great legal mind he thinks he can “get away with it”. 2. Putting a piece of paper under a person’s nose and telling the layed off leutinent to sign it or not get the “severance package” is considered “intimidation and harassment”. Look that up Mr. Manfre as case law does not support your HR approach on either point. You are lucky these poor people need other jobs so they will not sue and be subject to your black balling. Some compare Manfre to Fleming and say he is better. Can each of you truly believe that there is not one more honorable, more capable communicator who would be a more objective, moral, ethical and honest police chief anywhere to fill this position. This is about POWER, EGO and POSITION. He is a lawyer, then a police person, and now he fancies himself a business person. Perhaps someone ought to have him read about how Hitler’s grand plan to stave off losing WW2 was to create an army of children. Good luck to those young deputies and to all of us who will be the front line in them getting their experience. If it were not so sad it would be laughable as we sit here today with a massive void at all levels of leadership. Congrats! Manfre ! You earned my vote! For anyone other than you! And keeping untrained trigger happy cops on the payroll. And ignoring issues that should be addressed. Manfre is the one who needs to be fired ! Another vote for David O’Brian! As I read some of these comments it is good to know others are paying attention as well. make sense, fire three for one salary? He, Hoffman is a seasoned officer, as well, from another District . Like Sherriff, said he will ge a different perspective. Those three were road supervisors who worked the road. From all accounts I’ve heard is Hoffmans is an administrative job. So three highly trained road deputy supervisors were let go for onee office job. Yep makes sense alright…. I for one am not happy with the diminished presence of law enforcement that we all pay for. I said it before, i’ll say it again and again…….STEVE CLAIR FOR SHERIFF!!!!!!!!! From the article..”Manfre dismissed the notion that there was anything political about the moves, claiming he never knew who supported whom in elections”. This is an outright lie. These people attended the campaign forums and he most certainly knew who supported who.